Mary founded Epona in 2013, a retreat for personal development and wellbeing guided by the horse as a teacher and a healer. Mary’s childhood was on her paternal grandparent’s family farm in Scotland, both sets of grandparents being dairy farmers. After qualifying as an Optometrist in 1986 she moved to Jersey and has ran her independent private practice since then. Vision is such an important sense, so many patients having said it is the most important sense to them, the one they would least like to lose. We live in such a great time of medical and technical product advancement we can have errors in focus corrected without risk to sight. Mary’s particular interest lies in the relief of visual stress using coloured lenses. This is sometimes referred to as Meares-Irlens Syndrome. Some children find learning to read difficult, sometimes being labeled dyslexic or having learning difficulties. When there is difficulty reading, there is often associated lack of concentration and fatigue and this creates challenges within the classroom environment. It can be “eye opening” when someone first sees text in an unstrained form for the first time and reading becomes unstrained. For many years Mary had put all her energy into her practice and family and being so busy doing, something had to give, and that came in the form of a broken leg. This forced her to stop. She had not stopped since she had enforced time out in her 20’s when she had cancer. Ever since she was a little girl she had loved horses. 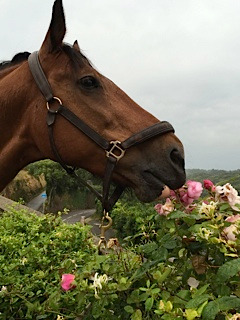 There had been working horses on both parents farms before the invent of the tractor and earlier her paternal side the family had been Clydesdale stallion men, the stud prefix being High, and on her maternal side her grandfather loved racing. 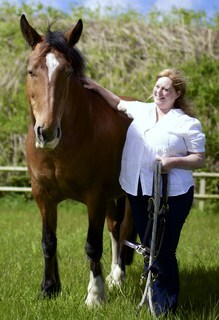 Eventually, her father brought a grey pony home, Smokey Boy and later a yearling Anglo-Arab chestnut filly, Lady Blaze. The decision was easy, the time had come to have horses back in her life. No sooner than this became clear, she got a call about a horse needing a new owner urgently, and this was the start. Then the house should be sold to buy a house with a field for the horse. Jersey is a small island and such a property is in short supply and relatively expensive. Nothing seemed right and by now she had two horses and no proper place for them to be liveried was available. It was time to consider giving up her Optometry Practice and relocating, possibly back to Scotland. Then, Le Catel Farm came on the market. The property needed modernization but it felt right. The development of the property’s accommodation has allowed this centre to be formed. Forest is my first boy, the boy who started me on this course. He is bay, Shire x and is 16.2h. He is the natural stallion of the herd, being the look out when the boys are grazing as a herd. I first became aware of his protective instinct not long after I came to know him. One evening, he wouldn’t settle in his stable although I couldn’t see what was wrong. He was getting increasingly agitated, and then the farmer came to ask for help to free an animal who had become trapped. After freeing it, when I went back to Forest, he was calm. Forest is the kindest, most loving boy. 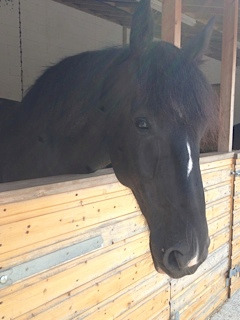 Roddy is a bay Irish Draught and he is 16.3h. He is immensely powerful and is clear and decisive in his thoughts and actions. He demands to be first to leave his stable, get his food, and get my attention. He knocks on his stable door with his toe. He is also very sensitive. He’s such a character. He and Forest are best friends and he relies on Forest to comfort him if he is concerned about anything. He has raced but was injured when young and was retired. Although the physically smallest and finest built of the boys, when they are running as a herd he is cheeky with the other boys. He has so much energy and is so light on his feet, he just springs into the air as if he has wings. He puts 110% into everything he does. He is a beautiful boy, so caring for the visitors who come here to learn and heal. He is a young boy and as his experience grows as does his confidence. Although most of his history is unknown, he may have been passed from one owner to another without having time to settle and show his abilities. He has come to trust he is home now. He and Sweetie are playmates. He truly is a kind gentle giant and is blessed with infinite patience. 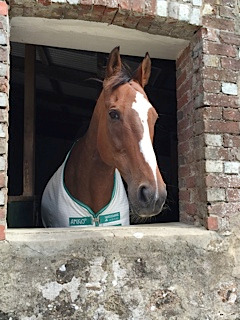 Bertie is a bay Thoroughbred standing 17h. He had a long racing career before retiring. He is a quiet, kind, deep thinking boy with a heart of gold. He is such a wise boy. As he has become stronger he is becoming more playful and enjoys running around with Sweetie in the field. This Spring he even challenged Forest for the stallion role. He does know his mind.